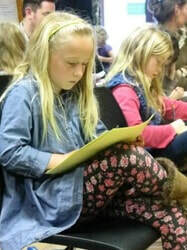 We worked with South Downs Storytellers and Lewes Girlguiding to run A Viking Adventure day in March. 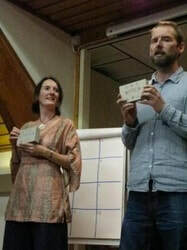 It included storytelling workshops, creating ink from honey and soot, dyeing skeins of wool, writing riddles and a mega storytelling session around a campfire. 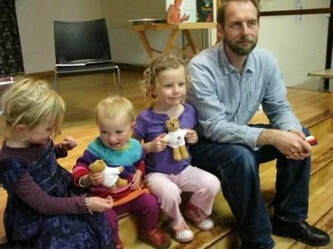 Some of the girls won a book for their creative riddles and they really enjoyed the storytelling workshops provided by Jon Mason. 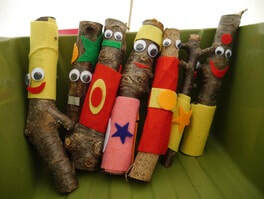 ​Our Story Tent at Southover Bonfire Society's May Fayre at the Lewes Priory ruins featured authors and illustrators Matt Carr, John Prater and Ronda Armitage, as well as our popular Stick Men. 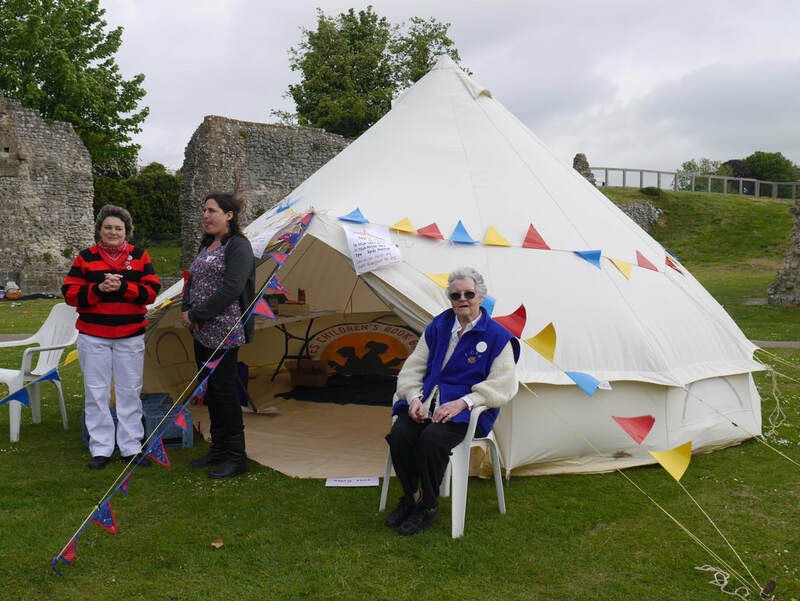 Our first Story Tent at Southover Bonfire Society's May Fayre at the Lewes Priory ruins. 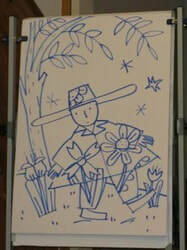 Authors Ronda Armitage, Laura Brett and Miriam Moss joined us to tell stories, and lots of Stick Men were made. 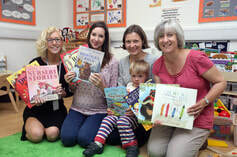 In addition to donating books to Lewes Children's Centre, we also supported their Summer Event, sharing stories and providing information on children's books. A founder member of LCBG, Diana Rogers has been involved with us for over 40 years. 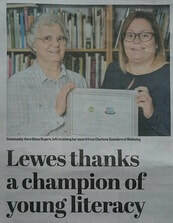 Her dedication and hard work was recognised through a Community Hero Award. For more details see The Sussex Express 4/9/15. 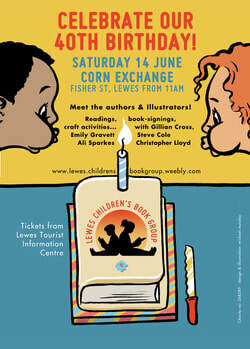 To celebrate our 40th birthday, we held an event in the Corn Exchange, Lewes, featuring authors Emily Gravett, Christopher Lloyd, Ali Sparkes, Steve Cole and founder member Gillian Cross. 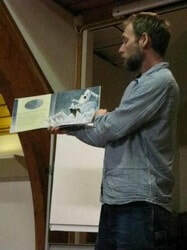 Lewes author / illustrator, David Lucas, read from his books and led a workshop on writing and illustrating a children's book for 50 children and parents on 16th October 2011. 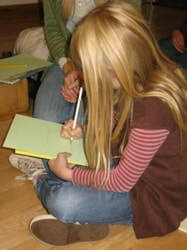 Both parents and children drew some of the characters from David's books and started creating their own picture books. 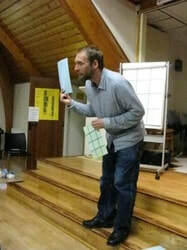 The photos include the picture David drew, step-by-step for the audience to copy, of his character Halibut Jackson.